In April, one of our developers, Tony, traveled to Baltimore for DrupalCon 2017. Tony specializes in the development of the Drupal sites we build here at Top Floor and he is always invested in learning more about the changes happening at Drupal. DrupalCon is an international educational event that brings together the people who use, develop, design, and support the Drupal platform. The event features dozens of curated sessions and panels from some of the most influential people and brightest minds within the Drupal community and beyond, as well as countless opportunities for networking, code sprints, informal conversations, and more. 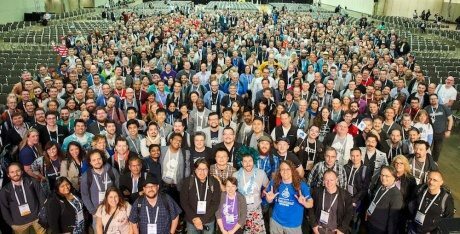 DrupalCon is the premiere conference to hone your Drupal skills, connect with the community, and learn about the future of web technologies happening on the Drupal platform. We asked Tony to give us a recap of his experience and a little insight into what DrupalCon is all about. The main things he focused on while in Baltimore were standardization of the development process, theming and integrating pattern-lab into a Drupal 8 theme. He was also eager to get a feel for how the community as a whole was doing. The conference began with Dries Buytaert’s annual keynote speech about the current status and features of Drupal. Dries is the founder and lead developer of Drupal. If you’re interested in catching up, you can watch the entire keynote presentation here. The rest of the conference was filled with sessions and discussion on various topics relating to the industry and several companies hosted events perfect for networking and connecting with other developers. One highlight was the “sprints” session, where hundreds of developers sat down together and knocked out bugs and issues. Tony mentioned the best part of the whole thing was the sense of community building. Drupal relies entirely on it’s large community of contributors to build and maintain the CMS. He said it was awesome to meet the maintainers of the project and work side-by-side with them.